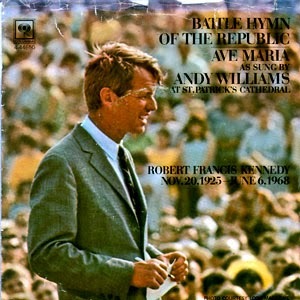 This performance of "Battle Hymn of the Republic" is from Robert Kennedy's funeral. So this week, we focus on him. 1) During WWII, when he was just 17, Robert Kennedy enlisted in the Navy. He was disappointed he was never involved in combat. Tell us about a time when you felt fate/circumstances kept you from something you wanted. 2) Bobby was trained as an altar boy and throughout his life regularly attended early morning mass. When is the last time you attended a worship service? 3) He may have been an altar boy, but he was no angel. During junior high he was suspended for punching a classmate. Who is the last person who made you very, very mad? 4) He had his first date when he was a senior in high school. Looking back, Mary Bailey Gimble told Kennedy biographers that she knew he had a crush on her and wondered why it took him so long to ask her out. Tell us about one of your early crushes. 5) Bobby's wife Ethel is as bubbly and talkative as he was introspective and shy. He was organized, she's messy. While opposites may attract, do you believe the happiest marriages are between partners who are more similar than different? 6) By November 1960, when he was 35 years old, Bobby already had served as legal counsel to two Senate committees and run his brother's successful Presidential campaign. He was looking forward to a quieter life teaching law but gave in to family pressure to become President Kennedy's Attorney General. Tell us about a time when you were at a crossroads. Who influenced your decision? 7) In 1777, Colonists celebrated July 4 with the firing of cannons and muskets, followed by a public reading of the Declaration of Independence. What is your neighborhood doing to observe the day? 8) The Revolutionary War still raged during that summer of 1777. General George Washington allowed his soldiers to celebrate with a double ration of run on July 4. Do you know anyone who is serving in the military this 4th of July? 9) Celebrity chef Rachael Ray says she considers mini-hamburgers, or "sliders," the All-American food. What will you be eating this 4th of July? SPECIAL NOTE: You have to click the "linky" to add your post and see everyone else's. Sorry for the extra step. ... Because Bookstraveller suggested The Backstreet Boys. Unfamiliar with this week's tune? Hear it here. 1) This video shows the boys in the band nervously await an audition. When were you last nervous? 2) BSB Brian Littrell was born with a congenital heart problem and had open heart surgery the year this song was released. Who is the last person you visited in the hospital? 3) Littrell had different health trouble in 2009. While working in Japan, he contracted swine flu, which caused the band to cancel several events. Have you battled a cold or flu this summer? 4) When you feel a cold coming on, what's your favorite remedy? 5) Brian and his cousin, fellow BSB member Kevin Richardson, are both from Kentucky and have been inducted into the Kentucky Music Hall of Fame. According to their website, if you tour the Hall of Fame you'll see exhibits that celebrate Kentucky's contribution to American music. Do you enjoy museums? Or do you think they're a snooze? 6) BSB Nick Carter was named one of People magazine's "Most Beautiful People in the World." Who is someone you think is especially gorgeous? 7) This spring Nick became a father for the first time. Is anyone in your life expecting a baby this year? 8) The band has been involved in ongoing litigation with their first manager, saying he had been dishonest with them about how much they had earned. Tell us about someone you trusted, but shouldn't have. 9) The band's recordbreaking 1999 tour was sponsored by the Sears department store chain. Sam remembers the twice-a-year shopping trips to Sears -- spring and fall -- with her mother to update Sam's school wardrobe. What's the last article of clothing you bought? SPECIAL NOTE: You have to click the the "linky" to add your post and see everyone else's. Sorry for the extra step. 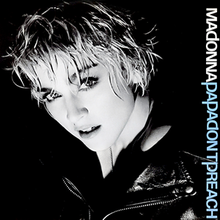 1) Madonna has sold more than 200 million records worldwide. Do you have any of her songs on your iPod/mp3 player/phone? 2) When she first arrived in New York in search of fame and fortune, Madonna supported herself by working at Dunkin' Donuts. What did you order last time you were at Dunkin' Donuts? 3) Madonna and her first husband, Sean Penn, ended their marriage on New Year's Eve, 1988. Sam's New Year's Eves are never that dramatic. What about you? Do you have any vivid New Year's Eve memories you'd like to share? 4) Madonna admits she suffers from brontophobia, aka the fear of storms. Are you scared of thunder and lightening? 5) Onstage during the 2015 Coachella fest, Madonna shocked the audience by planting a kiss square on the lips of much-younger rapper Drake. What's something that surprised you recently? 6) More recently, Madonna was at the center of a controversy because Prince fans didn't like her tribute at the Billboard Music Awards. They made themselves heard on social media. Was your last Facebook post or Tweet positive or negative? 7) One of the things Sam's papa preaches about is car maintenance. He reminds her to check her car's air filter regularly, because a dirty filter can reduce mileage. Share your own car maintenance tip with us. 8) When she was growing up, Sam's father was often away on business. He always remembered to bring back the complimentary shampoos, conditioners and lotions from the hotels where he stayed. When will you next stay in a hotel (or motel, bed-and-breakfast or Airbnb room)? 1) This song takes places on "the third of June," which is described as "another sleepy, dusty" day. Describe the weather where you were on Friday, June 3, 2016. 2) In this song, the family sits down to eat and discuss the doings of their friends and neighbors. Mama, Papa, Brother and Sister were at the table. Who did you have dinner with on Friday? 3) Young Billie Joe MacAllister playfully put a frog down another kid's back. Do you see many frogs where you live? 4) This song made Mississippi's Tallahatchie Bridge famous. What's the name of a bridge in your neighborhood? 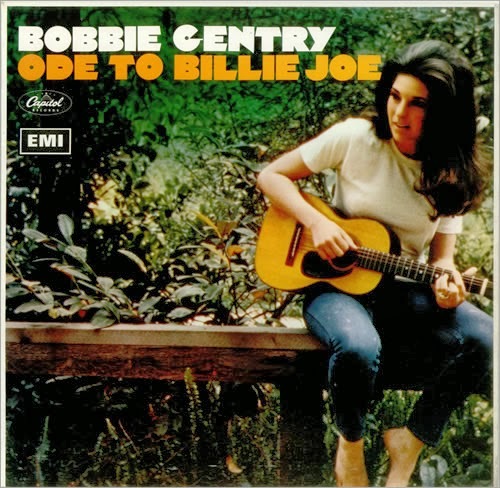 5) Bobbie Gentry often performed with Glen Campbell. Mr. Campbell's family is very open about Glen's battle with Alzheimer's. Is anyone in your life facing this terrible disease? 6) "Ode to Billie Joe" was made into a movie directed by Max Baer, Jr. Mr. Baer is better known for playing Jethro Bodine in a famous 1960s era sitcom. Can you name it? 7) Bobbie Gentry made one of her last public appearances in 1981 on The Tonight Show with Johnny Carson. 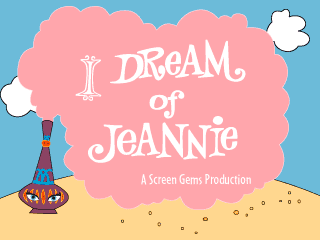 Johnny is now seen in reruns on the Antenna TV channel. Think of the last TV show you watched. Was it new or was it a rerun? 8) In 1967, when this song was popular, Sweden changed its traffic laws and Swedes began driving on the right. Have you ever driven in a foreign country? If so, did you have a hard time adapting to their laws? 9) Random question: Which would you rather have more of -- compliments or hugs?